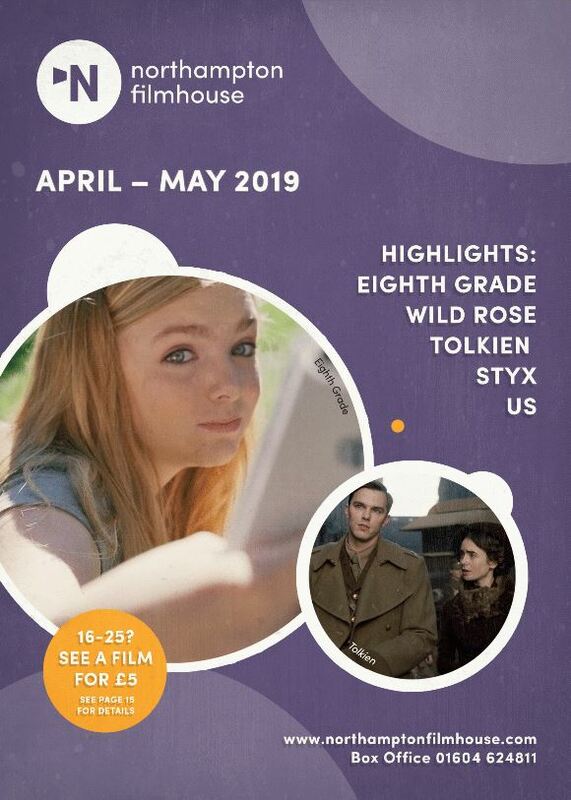 A great selection of films is now on sale for April and May at the Northampton Filmhouse, and with the increased flexibility of having a second screen, extra film screenings will be added to this schedule to meet demand. Brilliant new independent films include Vincent Van Gogh biopic At Eternity’s Gate, coming-of-age comedy-drama Eighth Grade, and the tense drama Styx. The cinema continues to present the best big new releases, including the story of J.R.R. Tolkien’s formative years Tolkien, starring Nicholas Hoult, as well as critically acclaimed horror film Us and the comedic western The Sisters Brothers. Northampton Filmhouse also presents a selection of coming-of-age classics to celebrate the release of new genre standouts Eighth Grade and Mid90s, including Rebel Without A Cause and Cinema Paradiso. The programme of event cinema features screenings of top class drama, ballet and opera, and sees the return of the annual Eurovision celebration. Over the coming months the cinema welcomes a selection of top independent movies including At Eternity’s Gate, a biopic of the famed but tormented artist Vincent Van Gogh, featuring an Oscar-nominated performance from Willem Dafoe. Eighth Grade follows a 13-year-old girl (a Golden Globe nominated performance from Elsie Fisher) through her last week of school, and comes from director Bo Burnham. Styx follows a busy doctor spending her annual vacation sailing in the Atlantic, before she comes across a boat full of refugees and is forced to make a momentous decision. Out Of Blue comes from British director Carol Morley (The Falling) and stars Patricia Clarkson as a detective who is drawn into a large mystery when investigating the death of a leading astrophysicist. Jonah Hill (The Wolf Of Wall Street) directs Mid90s, a coming-of-age comedy-drama about a 13-year-old (Sunny Suljic) who spends his summer navigating between his troubled home life and a group of new friends. Other independent releases include Vox Lux, starring Natalie Portman as an international pop star who finds fame through tragic circumstances at a young age. The film was nominated for the Golden Lion at Venice Film Festival. Lords Of Chaos follows 17-year-old Euronymous (Rory Culkin), who becomes fixated on creating ‘true Norwegian black metal’ with his band, however the lines between show and reality start to blur. Eaten By Lions tells the story of half brothers Omar and Pete as they embark on a journey to find Omar’s real father. The film is a heart-warming journey of self-discovery featuring a superb British cast including Asim Chaudhry, Vicki Pepperdine and Johnny Vegas. The Keeper tells the incredible true story of Bert Trautmann (David Kross), a German soldier and prisoner of war who is chosen to be a goalkeeper for Manchester City. Acclaimed theatre director Bill Buckhurst directs Pond Life, a British drama that follows a group of friends and neighbours in a quiet mining village just outside Doncaster as they search for a legendary carp in the nearby ponds. The film features an original score by Richard Hawley. Mads Mikkelsen stars as a man stranded in the wilderness in Arctic. He must decide whether to remain in the relative safety of his makeshift camp or to embark on a deadly trek through the unknown in the hope of making it out alive. The latest big releases coming up at the Northampton Filmhouse include Tolkien, starring Nicholas Hoult as the famed author who wrote The Hobbit and The Lord Of The Rings. Looking at the early life experiences that inspired the famous works, the film also stars Lily Collins. Oscar-winner Jordan Peele (Get Out) directs the chilling Us, a psychological horror following a woman haunted by an unresolved trauma from her past. The film stars Lupita Nyong’o and Winston Duke. Comedic western The Sisters Brothers features an all-star cast including Joaquin Phoenix, John C. Reilly, Jake Gyllenhaal and Riz Ahmed. Based on the novel by Patrick deWitt, the film is a reimaging of the cinematic Western as a dangerous, witty and cathartic exploration of what it means to be a man. BAFTA rising star nominee Jessie Buckley (Beast) stars as a Glaswegian mother-of-two on a quest to become a country music star in Wild Rose. From director Tom Harper (War And Peace), the film also stars Julie Walters. The Lego Movie 2: The Second Part sees the citizens of Bricksburg face a dangerous new threat. Family audiences can enjoy an Easter Family Ticket Offer of one adult and one child for £13 for screenings of this film. Other big releases include Captain Marvel, starring Brie Larson as Carol Danvers who becomes one of the universe’s most powerful heroes when Earth is caught in the middle of a galactic war. Judi Dench stars in Red Joan as a woman whose tranquil existence is shattered as she’s shockingly arrested by MI5. Hiding an incredible past, Joan is one of the most influential spies in living history. Ben Is Back stars Lucas Hedges as a 19-year-old who unexpectedly returns to his family’s home on Christmas Eve. His mother Holly (Julia Roberts) is relieved but wary, spending a turbulent 24 hours with him where new truths are revealed and a mother’s undying love is put to the test. In Holy Lands, Harry Rosenmerck (James Caan) leaves New York and his family with an unlikely plan to start a pig farm in Nazareth. The film features an all-star cast including Tom Hollander, Jonathan Rhys Meyers and Rosanna Arquette. The Filmhouse also presents the very best in world cinema, including Border, the Oscar-nominated fantasy from director Ali Abbasi. It follows customs officer Tina, known for her extraordinary sense of smell, who is challenged when Vore, a suspicious looking man, walks past her. Penelope Cruz and Javier Bardem star in Everybody Knows from acclaimed director Asghar Farhadi (A Separation, The Salesman). The film sees a woman’s eldest daughter abducted during a wedding, causing family and community tensions to rise. Happy As Lazzaro follows Lazzaro, a naïve and optimistic 20-year-old farmer who forms an unexpected friendship with Tancredi, a young man with an intense imagination. The film is directed by Italian writer-director Alice Rohrwacher (The Wonders). In 3 Faces, well-known actress Behnaz Jafari is distraught by a girl’s video plea for help to be able to pursue her studies and enlists filmmaker Jafar Panahi (Taxi Tehran) to help solve the mystery of the young girl’s troubles. Romain Gavras directs the stylish story of a small-time arms dealer who dreams of another life, but to escape, must do one last job in The World Is Yours. The film stars Vincent Cassel, Karim Leklou and Isabelle Adjani. Zhangke Jia directs Ash Is The Purest White, a Chinese crime-drama set in an industrial city in China following the story of a young dancer who falls in love with a mobster named Bin. The film was nominated for the Palme d’Or at last year’s Cannes Film Festival. Oscar-winner Paolo Sorrentino (The Great Beauty) directs Loro, a no-holds-barred look at life in Italy under modern Europe’s most infamous politician, Silvio Berlusconi. The Filmhouse also shows a range of documentary films, including Being Frank: The Chris Sievey Story. The documentary tells the story of Frank Sidebottom, fondly remembered as the man with the papier-mache head. The Oscar-nominated Minding The Gap follows three young men over a 12 year period as they bond together to escape volatile families in their Rust Belt hometown. Last Breath tells the true story of one man’s impossible fight for survival after a commercial diver is stranded with five minutes of oxygen and no chance of rescue for more than 30 minutes. Sharkwater Extinction is a thrilling and inspiring documentary feature that follows filmmaker Rob Stewart as he exposes the billion dollar illegal shark fin industry. In Breaking Habits, a commune of activist nuns run an illegal cannabis farm, telling their extraordinary story of rebellion, hope and revival. A Deal With The Universe is a very personal chronicle of becoming a parent, giving an initimate insight into gender identity and new parenthood. The film will be May’s screening in association with Q-Film Northants. The programme of films includes regular Dementia-Friendly screenings. Over the coming weeks there will be afternoon screenings of Stan & Ollie and 42nd Street. Stan & Ollie tells the true story of Hollywood’s greatest comedy double act, Laurel and Hardy, as they embark on a variety hall tour of Britain and Ireland as they look to secure their place in the hearts of the public. 42nd Street is the 1930s Oscar nominated musical directed by Lloyd Bacon. When leading lady, Dorothy Brock, is injured the night before the show opens, a naïve young newcomer has to replace the star. Our Dementia-Friendly screenings are open to all and offer people living with dementia, including early onset dementia, the chance to enjoy a classic film in a relaxed and supportive environment. The classics programme is supplemented with a range of coming-of-age classics to celebrate the release of two of the best in that genre released so far in the 2010s, Eighth Grade and Mid90s. James Dean gives an iconic performance as the new kid in town in 1955 title Rebel Without A Cause, directed by Nicholas Ray. Ken Loach directs 1969 drama Kes, starring David Bradley as a tormented working-class boy who is subjected to abuse at school and at home. The film won two BAFTAs upon its release. The Oscar-nominated American Graffiti follows a group of friends cruising the streets of small-town California on the last day of summer vacation. The 1973 classic was directed by George Lucas. Italian classic Cinema Paradiso follows the friendship between youngster Salvatore and projectionist Alfredo in a war-torn Sicilian village. The 1988 drama features a score from legendary composer Ennio Morricone. Good Will Hunting, the 1997 classic directed by Gus Van Sant, stars Matt Damon as janitor Will who solves a tricky maths problem and is discovered by a professor (Stellan Skarsgard) and therapist (Robin Williams). Ghost World follows two ultra-hip friends who have just graduated from high-school. The 2000 drama was directed by Terry Zwigoff and stars Thora Birch, Scarlett Johannsson and Steve Buscemi. Other classics include Monty Python’s Life Of Brian which returns to the big screen for a special 40th anniversary screening from its original release in 1979. The achingly funny take on Roman history comes from director Terry Jones. They Live comes from legendary director John Carpenter and follows a homeless drifter who discovers a reason for the ever-widening gap between the rich and the poor: a conspiracy by non-human aliens. The film will be May’s screening in conjunction with The University of Northampton’s Cult Film Club. The Northampton Filmhouse’s programme of event cinema allows audiences to see the best of theatre, opera, dance and music performances from around the world on the big screen in Northampton. Live broadcasts are very popular and are usually programmed further in advance than normal film releases. Cinema-goers can find the most up-to-date details of future live and encore screenings on the website, and advance booking is recommended. Forthcoming theatre and event cinema highlights include the Met Opera’s Dialogues Des Carmelites, in which Met music director Yannick Nezet-Seguin leads Poulenc’s devastating portrayal of faith and martyrdom. The Royal Opera House present Within The Golden Hour/New Sidi Larbi Cherkaoui/Flight Pattern, where the contemporary face of The Royal Ballet is shown in works from three of today’s leading choreographers. The RSC present As You Like It, a riotous, exhilarating version of Shakespeare’s romantic comedy from director Kimberley Sykes. The NT Live present All My Sons from the Old Vic, featuring Academy Award-winner Sally Field and Bill Pullman in Arthur Miller’s blistering drama, directed by Jeremy Herrin, and an encore screening of All About Eve from the West End, starring Gillian Anderson and Lily James, from director Ivo van Hove. The Filmhouse also hosts an annual Eurovision celebration, with an evening of fun hosted by BBC Radio Northampton’s Helen Blaby. The event includes a fancy dress competition, themed drinks and snacks and more, before the all-important competition live on the big screen.